Uvarovite is adopted on the last name of the Russian minister of inlightening of count A. A. Uvarov (1786-1855). Deposit minefield mine field occurrence subsoil is known on Ural (Russia, CIS), in Finland, Poland, India, USA and Canada. In the cut kind it is possible to entangle with an emerald, usually be found as crusts of shallow crystals on cracks in ultrabasic rocks. It rare Garnet, crystallizable usually as shallow crystals, round-off look, with streaked verges, without cleavage. Forms crusts or grainy the masses also. Colors emerald-green, in powder triturate - white. Glance (glitter, glare) glassy and semidiamond; mineral is transparent. Not added the action of acids and not melt fuse. Appears in serpentinite, enriched a chrome, in an association with chromite; in metamorphic rocks, rich in iron and manganese and ore minerals (skarn), in metamorphized limestones. The most known standards of this mineral take a place from Biserska on Ural (RF, CIS), Outokumpu (Finland) and Kap-daglyary (Turkey). In an association with diopside he is also in Oxford and in Canadian Quebec. In Italy found out Uvarovite in Sen-Marsel (area of Val-Daosta) and Val-malenko (an area is Lombardy). 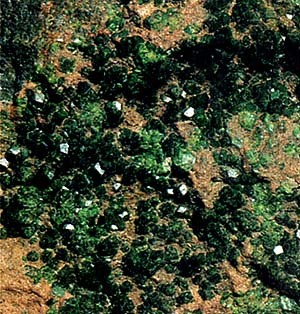 Uvarovite can be used as a semiprecious stone. But, as his commercial application is limited from his extraordinary rareness, it has exceptionally scientific and collection interest.